The Executives’ Association of San Diego – Effective Then...Effective Now! In the early 1920s San Diegans were alert to the threat of a general business decline from World War I. To meet this threat and to hedge their bets on the future, local business and professional men formed a local chapter of the International 100% Club. Their reasoning was sound. The new Club was designed for one task. The task was neatly summed up in an organizational announcement; "The sole purpose of the club is to promote, facilitate, and further the interchange of business information that will enable members to secure new business and thereby make money." Whatever their feelings about the need for another club in what was a well-organized city, local businessmen could hardly resist the bail labeled " ...and thereby make money." Organization of the new group began in the fall of 1922, and on January 6, 1923, the president of the International 100% Club presented the charter that marked the official beginning of the San Diego 100% Club. Four days later the first regular meeting was held and a president and officers were elected. 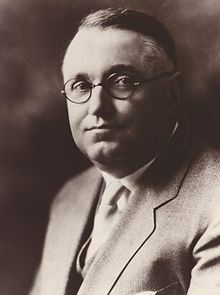 Walter Austin, of the Austin Safe & Desk Co., was elected president and other officers included Alfred LaMotte, of Thearle Music Co. and Rosco Porter, a prominent real estate developer. In addition to the officers, directors of the new organization included Charles Benton, Benton Roof & Paint Co.; Gordon Eby, life insurance executive; John Forward, Jr., Union Title Insurance Trust Co.: and Roy Saum, president of what was then Johnson-Saum & Knowel Mortuaries. The club quickly began operation and in short order members began to realize its effectiveness. Sticking to their original policy of avoiding civic, cultural, or social activities, the members found the interchange-of-business policy to be successful and profitable for all concerned. In fact, the professional membership recruiter assigned to San Diego by the International Organization found it easy to boost membership in the local club. Word of the group’s success spread rapidly and within a few months after its establishment, the San Diego 100% Club boasted nearly 80 members. During the early years, regular meetings of the club were devoted to craft talks and discussions of various business problems. In mid-1923 the use of "lead sheets" was adopted, and as use of the lead-recording forms increased, the organization became even more effective. Members of the 100% Club found that as the operation of their club became smoother and more efficient they had more time for activities in addition to craft talks and lead discussions. It was then the organization first began to bring in outside speakers to help members broaden their grasp of National and International business and financial trends. The success of these ‘outside" talks led the way toward general social activities for members, and by 1927 club activities had developed into a general pattern similar to today. In 1925 the International 100% Club organization became the International Executives’ Association, as member groups thought the new name would more closely describe their clubs. Early in 1926, members of the San Diego Club began to question the benefits of their group’s membership in the National Organization. Later that year some felt that membership in the nationwide association provided few benefits for San Diego members and the local group withdrew from the parent organization. On August 4, 1927, The Executives’ Association of San Diego filed papers of incorporation. A charter was granted and the club began operation as an independent, local organization, affiliated only informally with similar clubs in other cities. In 1929 the By-Laws were adopted and the Association, having successfully weathered its "growing pains" years, was set to meet the challenge of the great depression. It goes without saying that San Diego’s business community, along with the rest of the nation, was rocked by the depression of the 30s. The Executives’ Association of San Diego, with its tradition of business interchange and valid lead-giving, was almost entirely responsible for the success of some of its member firms in battling this financial storm. In the very bottom of the depression, with the business-failure box score climbing rapidly, members of the Association intensified their efforts to help themselves by helping each other. Every business-building stunt in the book was tried - coupons, script deals, introductory cards, and anything else that might help faltering businesses stay alive. Understandably, membership in the Association did decline during the depression years, but not to the extent suffered by other professional and service clubs throughout the city. The Association had proved its worth – and proved it during unprecedented national financial chaos. Early in 1930, with echoes of the market crash of the previous October still ringing through the business world, members of The Executives’ Association of San Diego decided to expand their organization. It was a wise move, for the expansion plan resulted in formation of the "Junior Executives," an organization that immediately joined in helping member firms weather the depression. 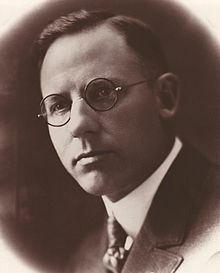 Under the leadership of the late Edmund L. Flood, then president of The Executives’ Association of San Diego, the new group was formed to parallel the activities of the senior organization and to offer second echelon executives an opportunity to enjoy the benefits of membership in the business-building club. 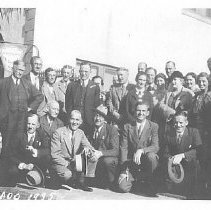 The junior group, today known as the Associate Executives, admirably succeeded in fulfilling the hopes outlined by President Flood in 1930 when he said, "We want to create a virtually independent auxiliary to the senior club that will provide its members with training in the operation of such clubs, prepare these men for possible membership in the senior association, and aid in getting business for our member firms." The nation had no more than climbed out of the depression when it found itself in World War II. Again, as they had during the trying times of the previous decade, Association members joined to help each other solve the problems of critical shortages, manpower, price ceilings, rationing, and the other war-born problems that plagued business and professional men. Before the war, one of the most active groups within the organization was the Leads Committee. During the pre-war period, the regular breakfast meetings of the committee were popular, well-attended affairs, where programs were jointly conducted by the Lead Committees of the senior and associate organizations. However, wartime manpower problems caused breakfast meeting attendance to fall off sharply and, by 1944, attendance was down to less than a half dozen members. Because of the devotion of this small group, the meetings continued without interruption through the war years and the Leads Committee continued to provide business-building ideas for Association members. The end of World War II saw a rapid increase in Association membership as San Diegans made the change to a peacetime economy and as members returned from wartime service to take their places again in San Diego’s business community. Today, with a background of many years’ experiences in serving its members and in enabling them to serve each other, The Executives’ Association of San Diego has achieved a unique place in local business life. It’s a group that represents many of the city’s largest businesses, yet it never has sought to become a political power. It is an organization that, through good times and bad, has maintained high membership standards by consistent, active participation in Association activities. It’s an Association of leading business and professional people that combine a serious purpose with a warm, friendly, informal manner of operation. Quite simply, the Association is a tribute to our nations’ free competitive enterprise system – a system that enables free men and women to work together with confidence and mutual respect for the good of all.